We thought it would be appropriate to write down some proper gun shop etiquette, as many of our readers are new gun owners. The following is a decent summary of what is and is not acceptable in most gun stores. There are four things you must do when handling a firearm in a gun shop that you can never forget and never fail to do. 4. Check the chamber. Every time, with every firearm, regardless of the circumstances, check to make sure the firearm isn't loaded. If you don't know how, ask the attendant. 3. Point the firearm in a safe direction, up usually being the safest. Unless you intend to kill a man, under no circumstances is it ever OK to point a gun at someone. 2. Stay at the counter. If you have a firearm in your hand, do not walk away from the counter unless the attendant has specifically told you that it's OK to do so. Doing so will create a real weird -- and potentially dangerous -- situation in a matter of seconds. 1. 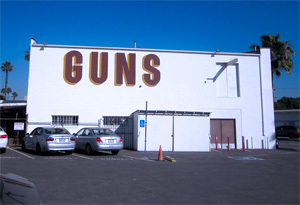 Above all else, never load a firearm in a gun shop for any reason what-so-ever, never, ever. Clown: Very few things in life are more unnerving than the guy with a gun in his hand -- loaded or not -- that's just acting too excited. Don't be the guy waving the gun around and going, "bang! bang!" with a big smile on his face like he just got his hands on this year's most popular toy. Don't start jumping up and down like someone just handed you a box of puppies. Don't walk into a gun shop wearing a ski mask over your head with your pockets stuffed full of magazines. Bada$$: Speaking of the dude that looks like he's walking in to rob the joint, don't be that guy either. There's no reason to walk into a gun shop with shades on and the brim of a baseball cap burying your eyebrows. Leave the trench coat in the truck. Don't be the guy with his hands stuffed down his pockets that keeps looking over his shoulders as he mumbles and nods, pointing with your nose, "let me see that one there." Want to freak everyone out? Act suspicious in a gun shop. Greenhorn: Don't be the tool that picks up a pistol by the muzzle -- so your pointing it at yourself -- and then says, "oh yea," and then turns the gun around so it's pointing at the guy behind the counter. Think someone is going to trust you with a gun if you if you act like you don't know your hind end from a hole in the ground? The man is going to be thinking, "yea, really want to send this guy home with a sidearm and a box of shells so he can leave it laying around the house for a kid to get ahold of." Enthusiast: Walk in with a smile on your face and visit excitedly, but quietly, about a particular firearm you're interested in buying. Don't ask him to pull it out of the display immediately. Ask him to tell you a little about it first. If you know something about the firearm, share with him. When he asks you if you'd like to handle one of the sidearms, rifles or shotguns, simply say, "yes." Serious Gun Owner: It's fine to have a serious demeanor. Being respectful of firearms is a trustworthy quality. If you act normal, a serious demeanor gives people confidence in your ability to handle a firearm. Explain to the man behind the counter what you want, maybe tell him why you're interested in a particular model, and ask him if he has any in stock. Look him in the eye when you talk and show interest in the information he gives you. Informed Novice: You're not going to turn anyone off by admitting that you know very little or nothing about firearms. By being honest, you'll develop a report with the salesman and he will, more than likely, take measures to keep both of you safe as you're handling the weapon. By being mature and forthright, -- even though you lack knowledge -- you're going to learn a great deal more, a great deal faster, about firearms. Thanks for reading and please add your comments and questionss below. If you work in a gunshop tell us what you think.